A release from the organizers of the SSBQ said present and prospective participants in the quiz are asked to note that this year, for the first time, there are four special awards to be presented. These are the Frequent Participant; Outstanding School; Distinguished Graduate; and (NEW) the Acute Cosmetics Beginners. Details on these can be had at www.ssbq.org or by contacting the organizer Joel Jack at 593-4345 or quiz@ssbq.org. 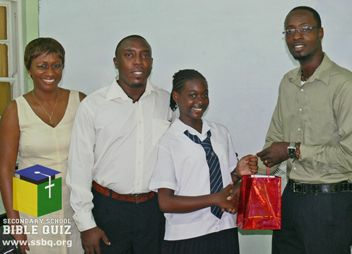 The release said students writing the CSEC this year who have entered the quiz in the past still have an opportunity to win the iPad that will be on offer for the Distinguished Graduate Award. To be eligible, they must have entered at least five times before the end of August. The SSBQ is in its sixth year and is designed to âencourage students of secondary schools to read, love and follow Godâs Words,â the release said.